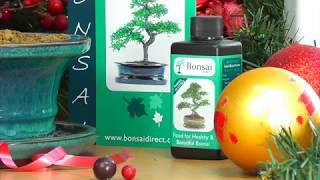 Buy the Complete Beginners Character Christmas Bonsai Kit from Bonsai Direct. A perfect gift this Christmas time which includes the fabulous beginners Chinese Elm (S-Shaped) bonsai tree with drip tray, pruning scissors, bonsai fertiliser, Santa foil balloon and red watering can. You can choose your delivery date at the checkout. Delivery is free to most areas and full care instructions are provided. • Character twisty Chinese Elm Bonsai - fun to prune!